In contrast to the merry pubs of Dublin and the gorgeous green hills of central and western Ireland, somehow I imagined Northern Ireland to have darker skies and slightly more foreboding imagery. I envisioned taking a daytrip with a slightly more serious tone. It may have been the day’s itinerary: a visit to scenery straight out of Game of Thrones, a rickety rope bridge, and dark stone columns along the cold coastline don’t provide the same lighthearted feeling that food tours and fishing villages tend to elicit. Still, Adam couldn’t wait to see the spot featured on Led Zeppelin’s Houses of the Holy album (and the inspiration for the classic arcade game Q*Bert? ), so we hoped for blue skies and booked a day trip. 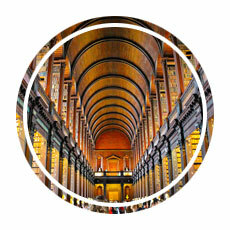 Like an episode of déjà vu, Adam and I made our way to O’Connell Street and boarded a bright green Paddywagon Tours bus, this time headed north to destinations in Northern Ireland. Our tour was destined for difficulties from the very beginning. We spent 20 minutes parked on the side of the road while our driver tried to help a family sort out what tour they were supposed to be joining for the day. As it turned out, the tour they had booked with another company had departed without them, so our driver accommodated them on our bus (a move I thought was very classy). Delayed but hoping to make up some time, we finally got on the road. 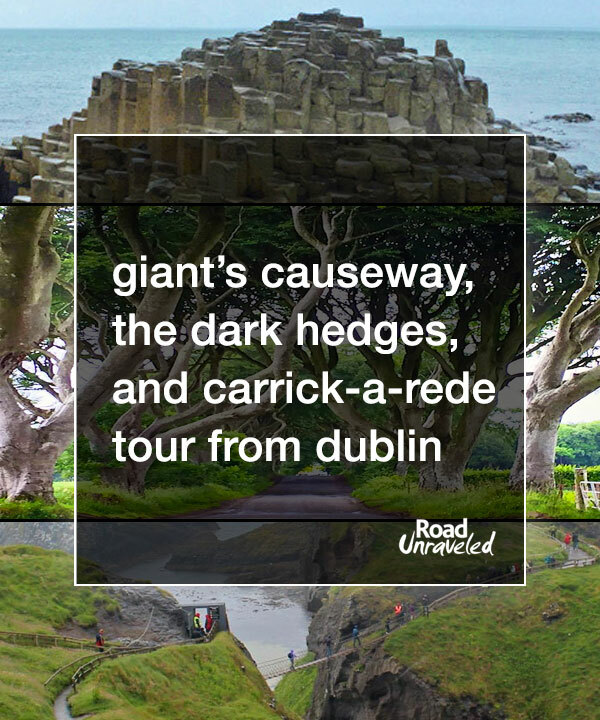 After a quick stop for coffee and breakfast at a rest area, we crossed into Northern Ireland and headed toward the Dark Hedges. 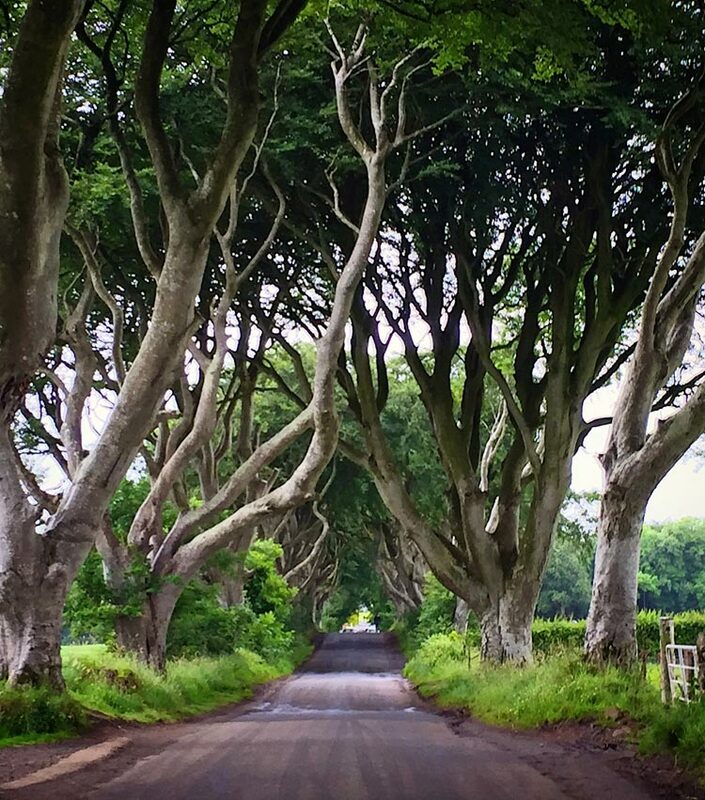 Made famous by Game of Thrones, the Dark Hedges are effectively some very dramatic landscaping planted by the Stuart family in the 1800s to impress guests as they approached their property. The road is lined with tall trees that have grown to the point that their branches are tangled together, forming a tunnel. We hadn’t yet seen the clear skies we were hoping to encounter, so the scene looked quite ominous as we stood in a light rain looking down the road. While neither Adam nor I watch Game of Thrones, we’re starting to think we should; this was the second destination we visited this year where the show is filmed (with Dubrovnik being the first). It was fun to be somewhere made famous by a popular show, but the landscape alone was impressive enough to visit without it needing the popularity boost. 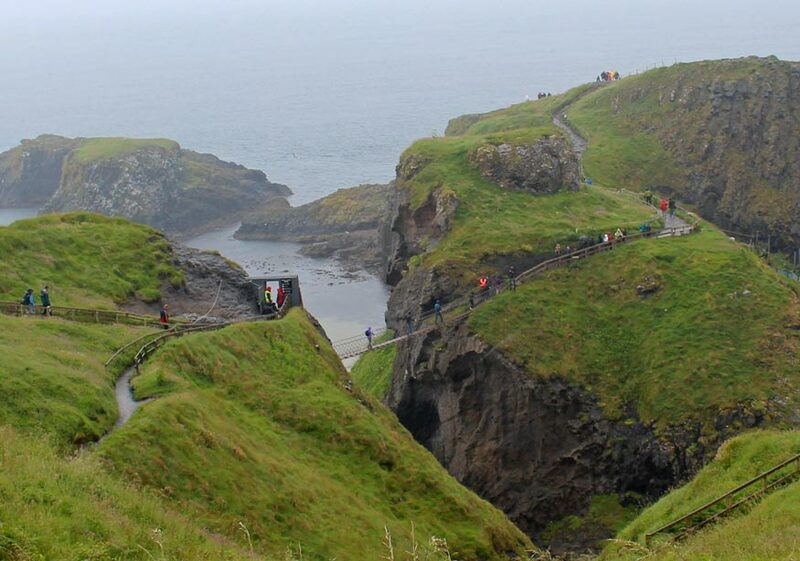 Our second stop was for those of us who wanted to cross the Carrick-a-Rede Rope Bridge. Spanning almost 70 feet in length and hanging 100 feet about the ground, the bridge was constructed years ago to help fishermen cross from the mainland to the tiny island of Carrick-a-Rede. Early bridges were even more perilous than the existing one; in the 1970s the bridge had just one handrail for fishermen to grasp as they made their way from one side to the other. Walking across is not an easy feat for those who have a fear of heights or can’t handle the sensation of the bridge swaying beneath their feet. It’s made even more difficult in the rain. Our bus pulled into the parking lot as the light rain became steady, with unrelenting gray clouds practically touching the horizon. It’s about a 20-minute walk from where tourists are dropped off to the bridge itself, and the journey takes you down a hill with several staircases that become fairly slippery in the rain. We took it very slow so as not to slip like some of the other tourists we saw. When we finally arrived at the bridge, we waited for about five minutes for our turn to cross. Honestly, I wish crossing it were a bit more pleasant than it was. The staff responsible for ensuring safe passage kept the flow of traffic moving, but as a result we didn’t get great pictures of the view—nor did we get to enjoy it, as the rain forced me to keep my head down so I could see where I was going. The island was just as slippery as the walk to it, and while Adam climbed around a bit I mostly stayed stationary so I wouldn’t fall on the rocks. The walk back across the bridge was a bit more windy than the walk over, so the swaying was much more pronounced; even the staff person I passed when I was back on solid ground commented on it. It was another 20-minute hike back to the bus, this time uphill, and by the time we arrived our clothes were so soaked I couldn’t take off my jacket because it was stuck like plastic wrap to my arms. Even still, Adam and I smiled as we scrolled through the pictures we managed to take between raindrops as we drove off for a great lunch (steak and Guinness stew for Adam, Irish stew for me, both of them perfect for two weary and wet travellers!). Warmer and slightly drier, it wasn’t long before our bus pulled into the parking lot at Giant’s Causeway. While there is a bus that will transport guests from the visitor’s center to the main attraction for a fee, Adam and I decided to walk down the hill. 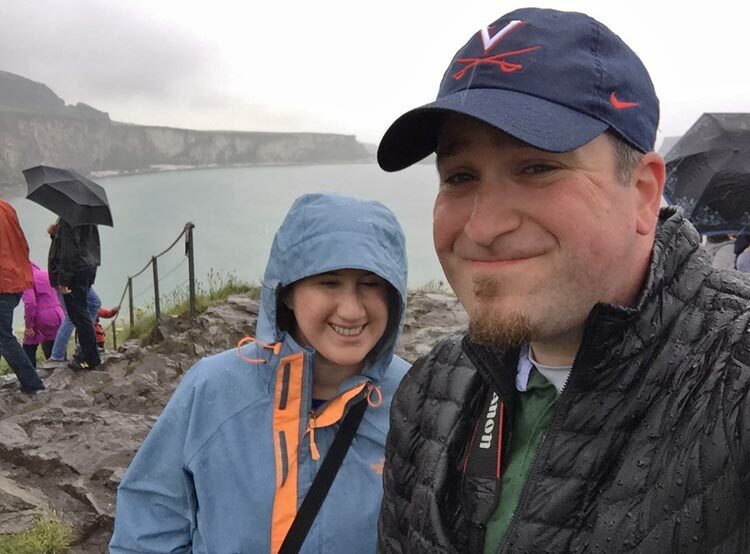 Giant’s Causeway is an incredibly impressive sight to behold—even in the same steady rain that had somehow followed us from Carrick-a-Rede. About 40,000 interlocking stone columns comprise the UNESCO World Heritage site, which formed 50-60 million years ago after powerful volcanic activity rocked the area. 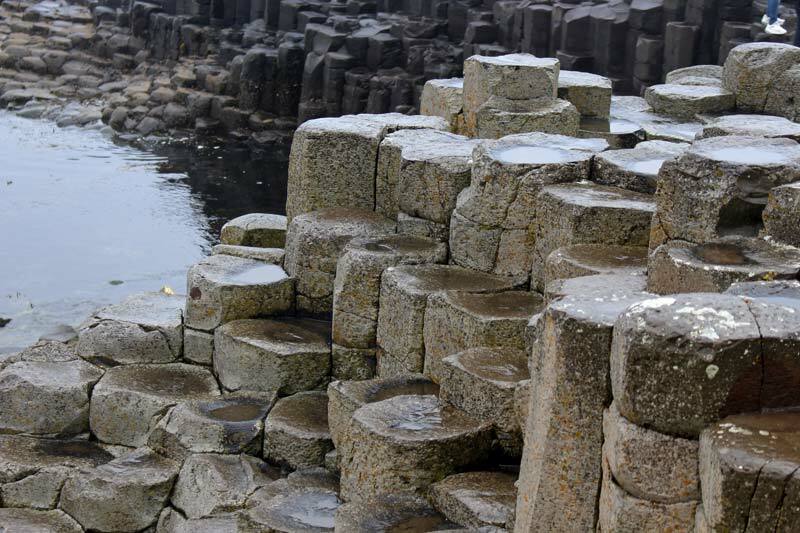 The resulting lava cooled in pillar-like structures around the coastline, ultimately creating the unique stone patterns that are so identifiable today. Of course, that’s the scientific explanation. Local legend tells a different tale in which a giant named Finn McCool challenged a Scottish giant to a fight; however, he backed down after recognizing that he was much smaller than the opposing giant. To escape the impending conflict, Finn’s wife dressed him as a baby. When the Scottish giant arrived at Finn’s house and saw him posing as a baby, he immediately realized that if the infant was the size of a grown giant, the baby’s father must be much, much bigger than him. He ran back to Scotland, destroying the causeway that connected Northern Ireland to Scotland so Finn couldn’t find him. The visitor’s center showed a great video that depicted the story as a cartoon, a fun contrast to the science that explains how the causeway formed millions of years ago. 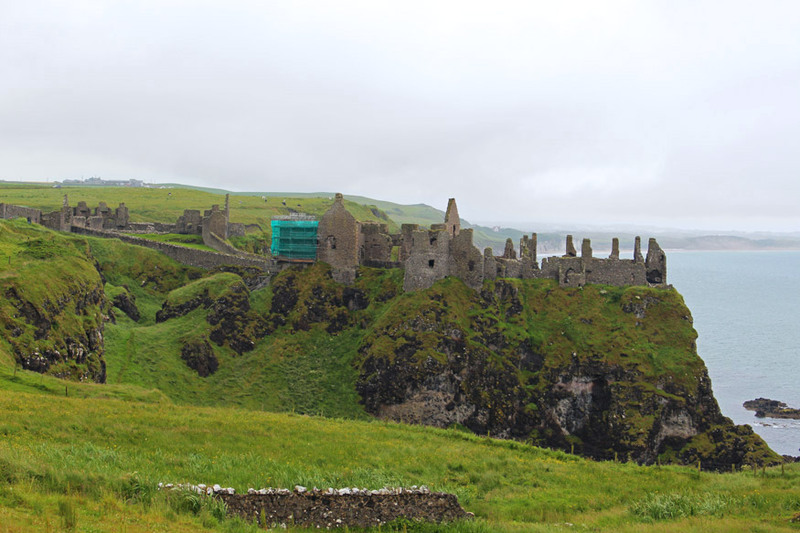 We spent some time cautiously climbing up and over the stone towers; like everywhere else we had visited that day, the ground was slippery and covered in puddles, and the rain just kept falling. The rain also made things tricky when it came to taking photos. 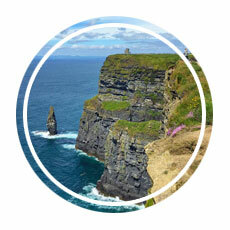 So much for the blue skies we had seen the day before at the Cliffs of Moher! It was dark and cold as we made our way back to the visitor’s center and, eventually, the bus. We spent a long time waiting to begin the ride—twenty minutes passed before our driver announced that he was about to do something he had never done: he was going to leave someone behind. 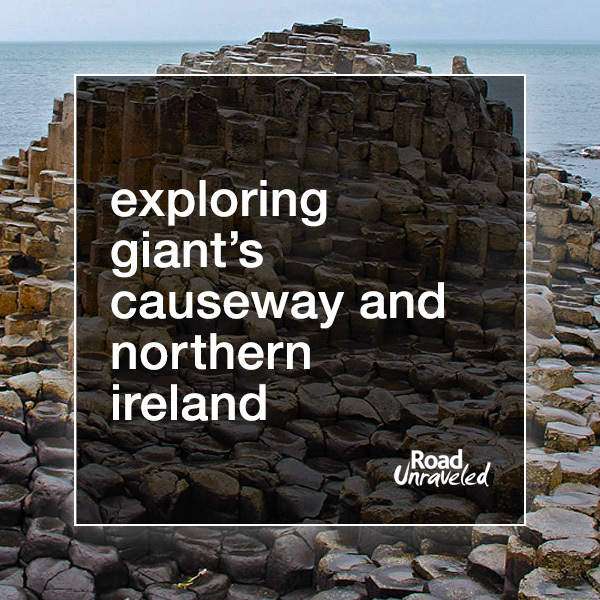 It seemed one of our fellow tour companions hadn’t returned from the causeway, and rather than continue to inconvenience all of us we were going to head toward Belfast, our final stop. I was on a tour once before when a guest went missing, and that tour also left without that passenger, so there was nothing to do but hope the person was OK and focus on the next stop. On our way to Belfast, we stopped by one final historic castle. As with our earlier stops at the Dark Hedges and Giant’s Causeway, Dunluce Castle was yet another location featured on both Game of Thrones (as the House of Greyjoy) and inside the cover of Led Zeppelin’s Houses of the Holy record. It was a quick stop, long enough for everyone to take a couple photos and then we were on our way. We arrived in Belfast much later than expected; we had already lost close to an hour of the day thanks to the passengers we rescued in Dublin and waiting on the missing passenger at the causeway, so by the time we arrived it was so late the shops and tourist spots were closed. And it was raining again. We decided to take cover in a bar while we spent our brief, one-hour visit to the city. 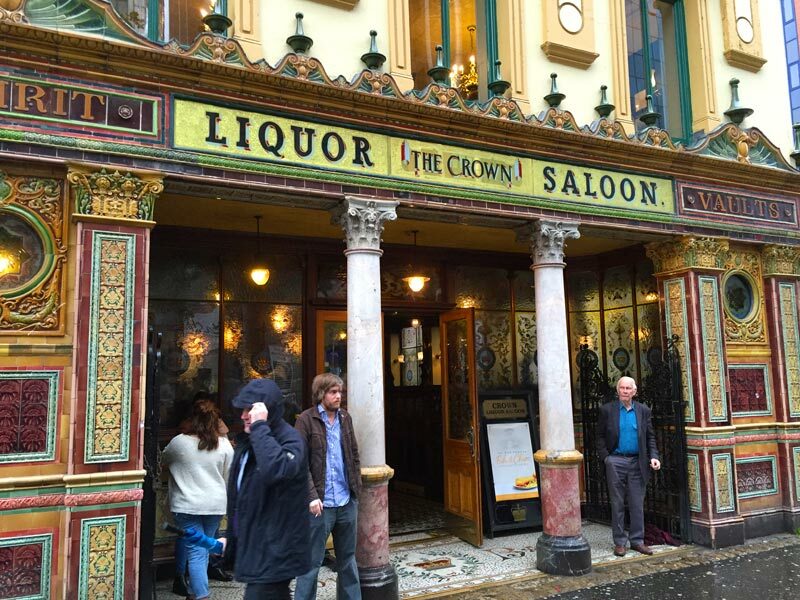 Our driver pointed us toward The Crown, perhaps the most famous bar in Belfast. Dating back to the 1800s, the bar is one of the most recognizable to the locals. Unfortunately, it was not recognizable to us; we ended up drinking Guinness down the street at the bar we mistakenly thought was The Crown. By the time we realized our error we had already ordered and paid for our drinks, so we enjoyed them anyway. By the time we got back to the bus our driver had received word that our lost passenger was in a taxi en route to Belfast, so we spent another twenty minutes waiting for him to rejoin us. When his cab arrived he was met with a somewhat lackluster round of applause from those of us who had spent close to an hour waiting on him, and then it was finally time to head to Dublin. We arrived 90 minutes later than scheduled, too late for dinner, so after a quick souvenir stop we walked back to the hotel. 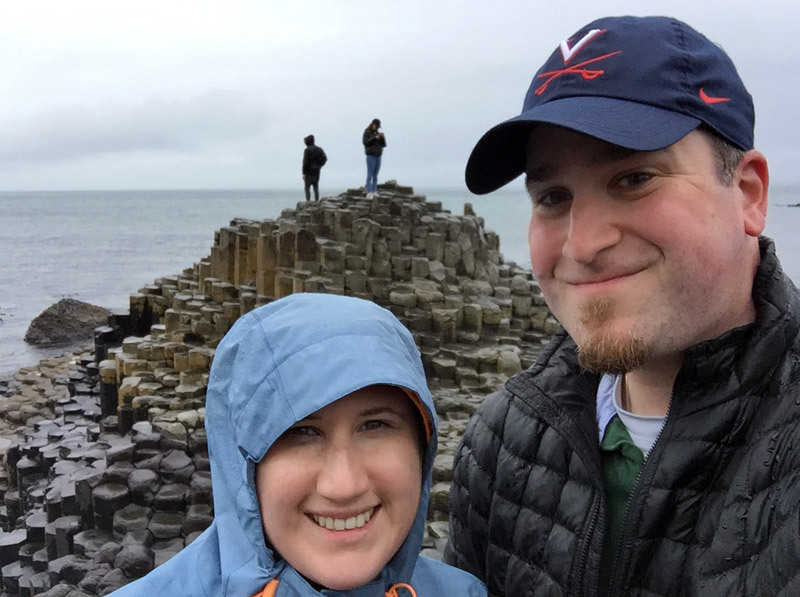 Our trip to Giant’s Causeway was somewhat guided by mishaps and bad weather, but despite all of the challenges we had an incredible time. Travel is rarely perfect; often our enjoyment of any tour or attraction is due to our desire to have fun and make the most of every experience. 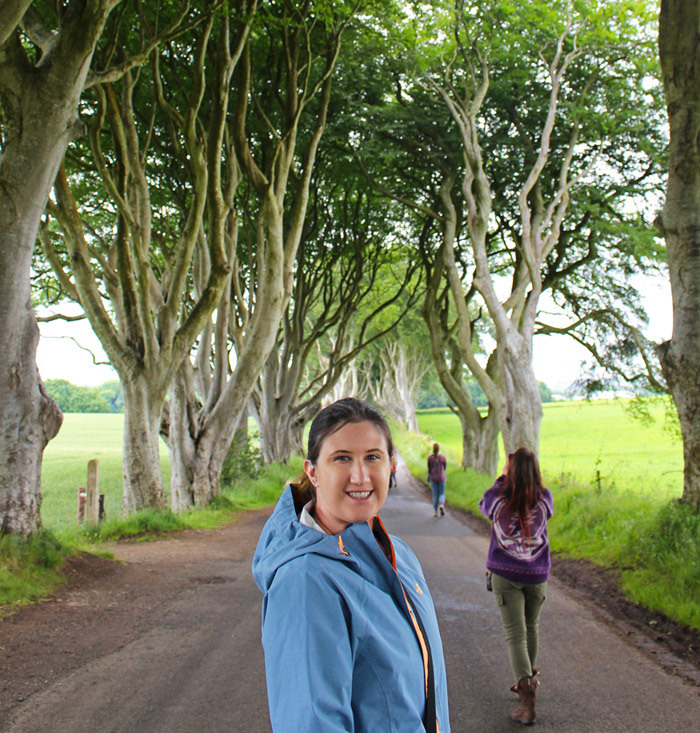 Our visit to Northern Ireland was no exception. It would have been easy to let the rain ruin our impressions, but instead it has become a bit of a badge of honor for us. We crossed the Carrick-a-Rede Rope Bridge in high winds! 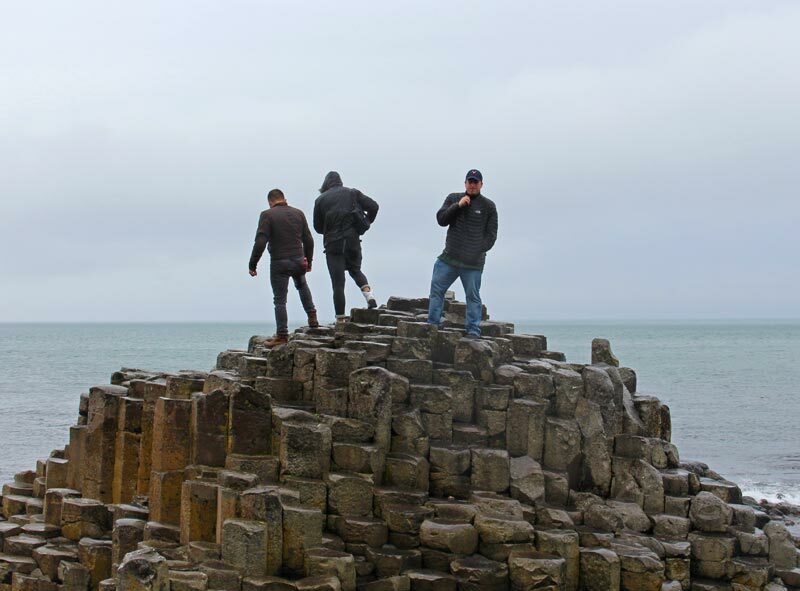 We walked Giant’s Causeway in pouring rain! We drank Guinness in a non-touristy Belfast bar with the locals! You can’t control everything, but you can control how you react to any situation. We’ll smile every time we see the pictures of us, drenched and shivering and having a great time anyway. 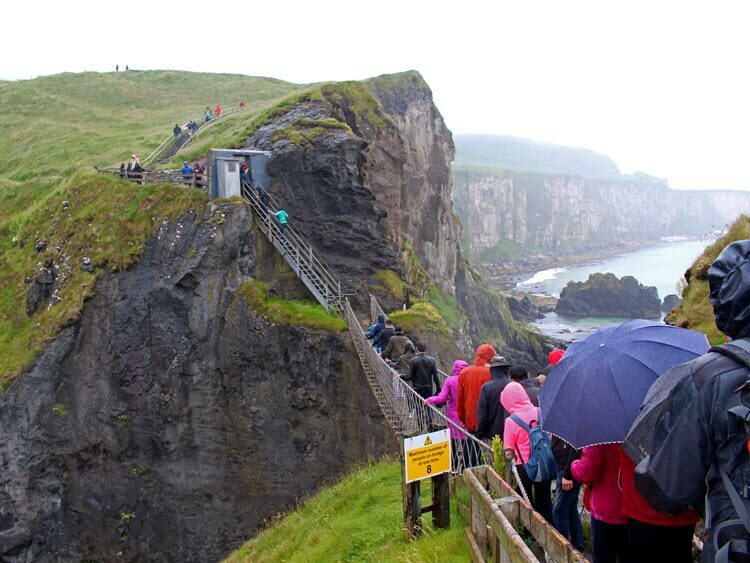 And while we would visit Northern Ireland any day, we’ll certainly hope for a little less rain next time.